Maintaining Epoch’s mission of affordable motoring that is reliable and engaging, the Epoch A14 provides owners with a zest and spark that no other vehicle on the road can offer. Featuring a modern and dependable front-wheel-drive platform, powered by a smooth and efficient 1.4L engine, the A14 maintains a sense of enthusiasm and purpose. 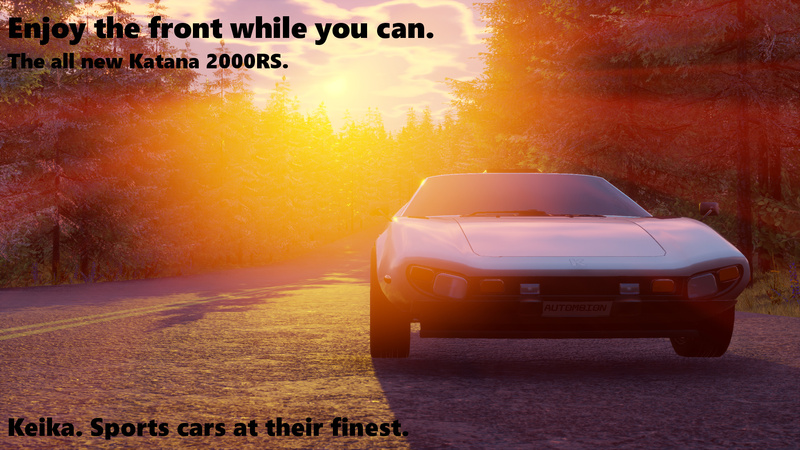 Test drive today, and discover your own sense of Epoch. 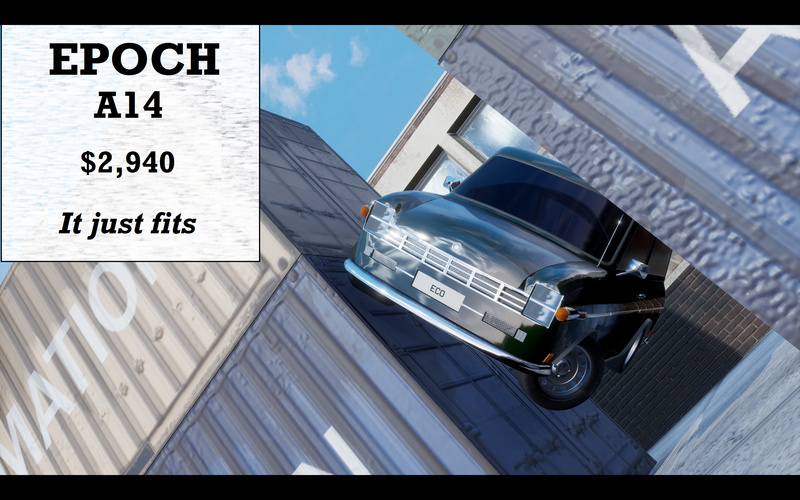 Epochs: Now on a scratch and dent sale. May have fallen out of container after shipping. How does American automaker survive Malaise Era? Simple. Make smol cheap cars that Americans want to buy. 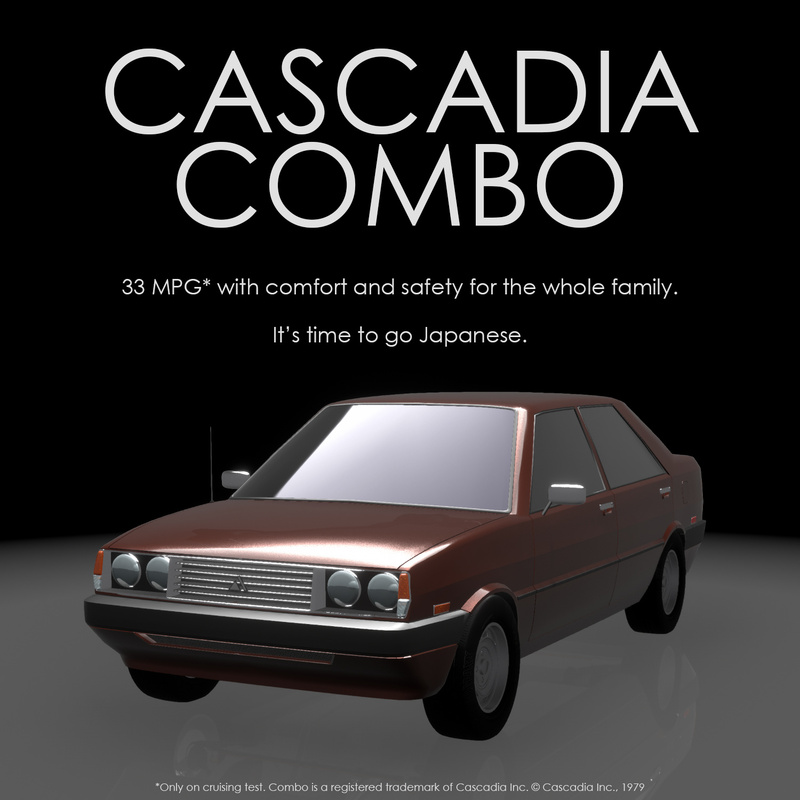 And this little guy made sure the BMW E30 wasn’t the only compact luxury car from the 1980s that we adore. William Bennett: Madame President, it’s time to send out the press vehicles. Rathbone: Ah yes! the press vehicles. Bennett: I would like a better showing in Motor World Review than last time. Bennett: They criticized our low gas mileage and high price. Bennett: Still, it’s easier to spin positive reviews, than rely on esoteric claims of luxury. Bennett: I’m afraid that won’t be available in time for publication. We missed our deadline, and now are looking at an April 1/2 year launch. Rathbone: Look! You’re the marketing genius here. I really don’t care! I’ve got cars to design. You can send them the Limo for all I care. Bennett: I don’t think I should. 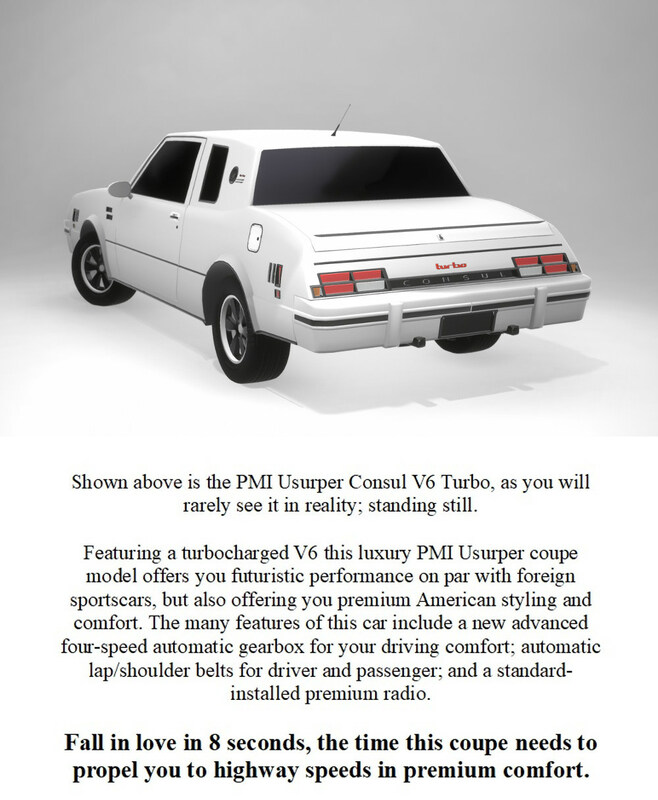 Besides, they already did the Virgo back in '79. Bennett: I think we should send them the Libra, or the Capricorn. Rathbone: Ooh! That’s good! 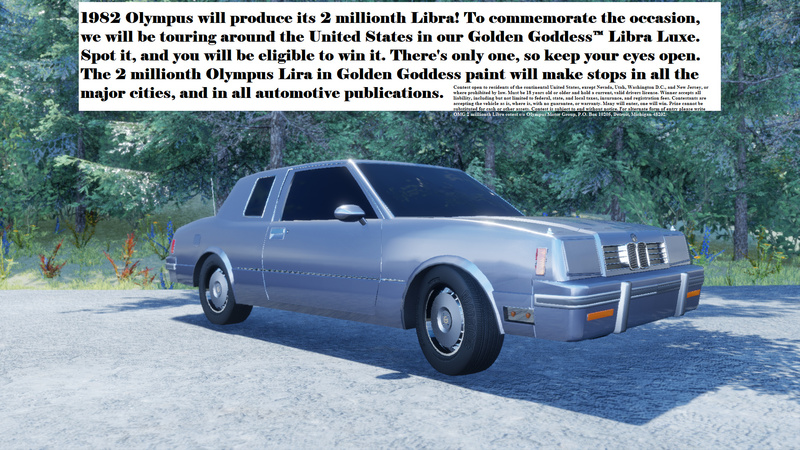 We should send them the special Libra. 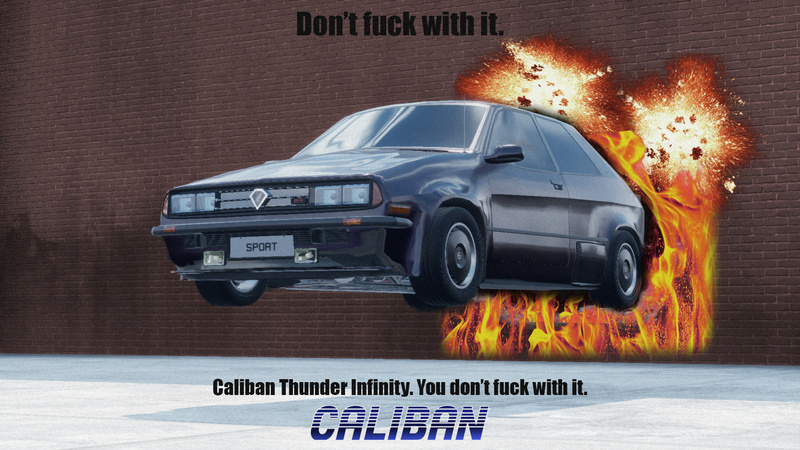 Click here to learn about the first Thunder Infinity! 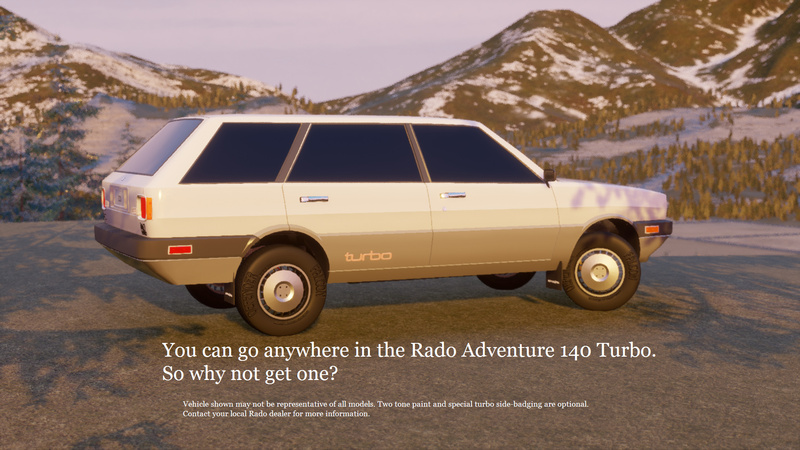 Rado had finally gotten something off the ground in the car market, and by 1981 they were ready to begin development on two new projects: Project Strength, their upcoming engine design to succeed the current 2.3 liter 4 cylinder, and Project Bone, a new platform. Despite, concerns about biting off more they could chew, the projects moved forward, although they would not be able to reach production until 1984/1985, so for 1982 something far more modest was done. Morning all. I am still missing 14 out of 26 possible submissions. I am going to be out of town until Sunday evening, so this is the last warning I’m going to be able to provide. Get 'em in! At the start of the 1980s, Erin was in financial ruin. Their strong range of cars had been whittled down to just two models, and they were in desperate need of reform if they were to continue in any shape or form. 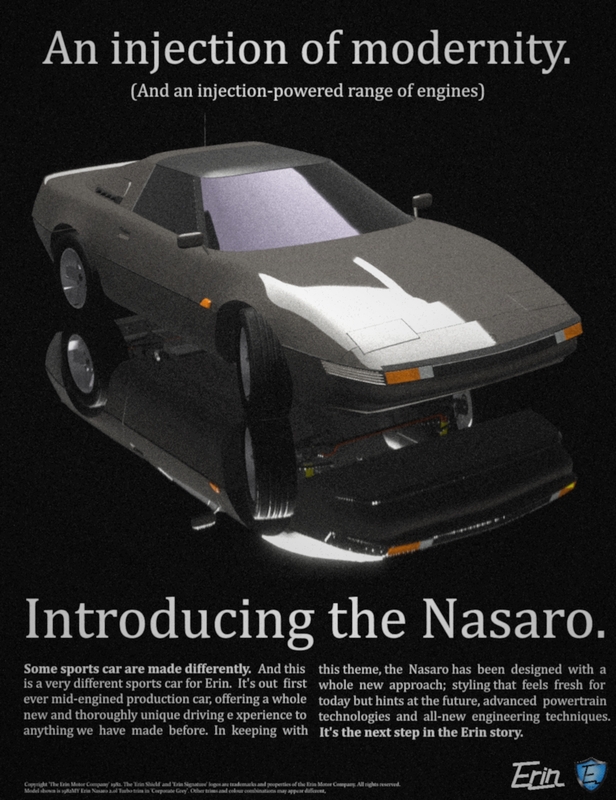 Enter the Nasaro, a new mid-engine sports car designed to revitalise the company. Competing in the same price range as the hot hatch market with its entry-level 2.0l Turbo model (shown here) and with the sports saloon market (i.e. BMW M3 and the like) at the top end, the Nasaro was a bold step in a new direction for Erin. Styled by newly hired Head of Design Chris Famerley and based on a secretive late-70s project called the “New Sports Concept”, the Nasaro would go on to be one of Erin’s most succesful sports cars ever, bringing in the necessary profit to update the rest of their range a year later, as well as seeing incredible success as a Group A touring car machine from 1983 to 1986. Within the wedge-shaped lines of the mid-engined Nasaro, Erin’s climb back to success was to be found. 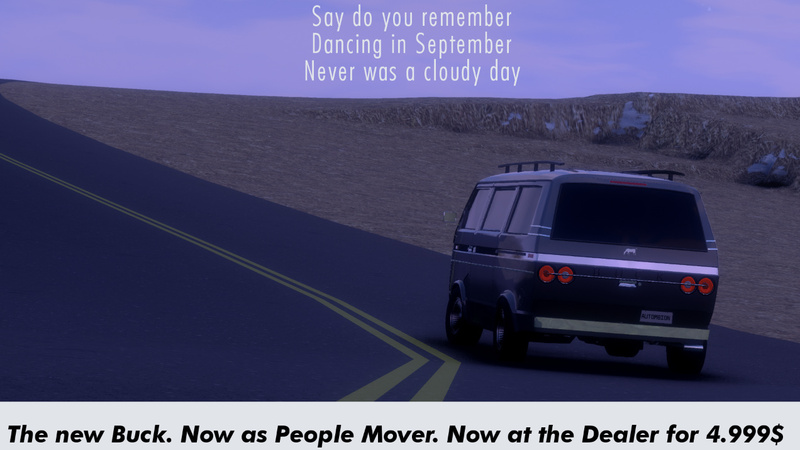 it was the car that saved the company both from financial ruin and indeed itself as a whole, finally bringing the odd British brand in line with the general standards of different car classes for different markets. When Erin had tried to corporatise before (see the latter half of this post), it had gone disastrously, because in the company’s heart to do so. 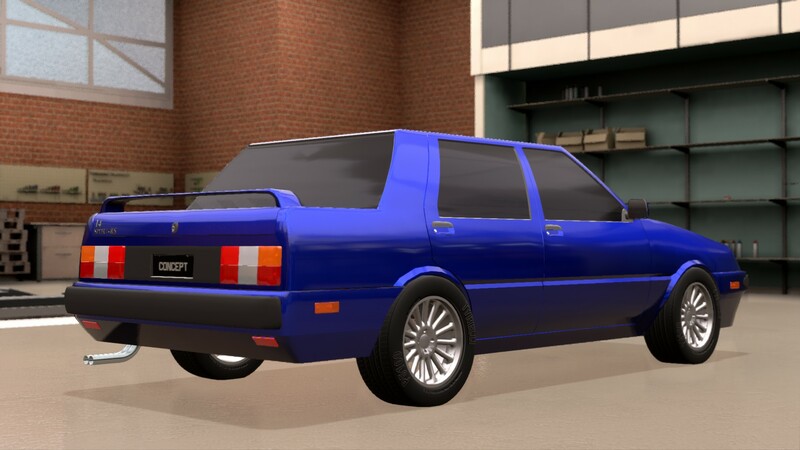 But now, left with little option but to conform and rebuild, Erin were finally ready to become a proper car company like their rivals, and they did it with all the flair that had ensured their fairly continuous success so far. Maesima’s entry into the US came about due to the efforts of an American businessman David R. Clark. In the mid-1970s, after selling his chain of gas stations. 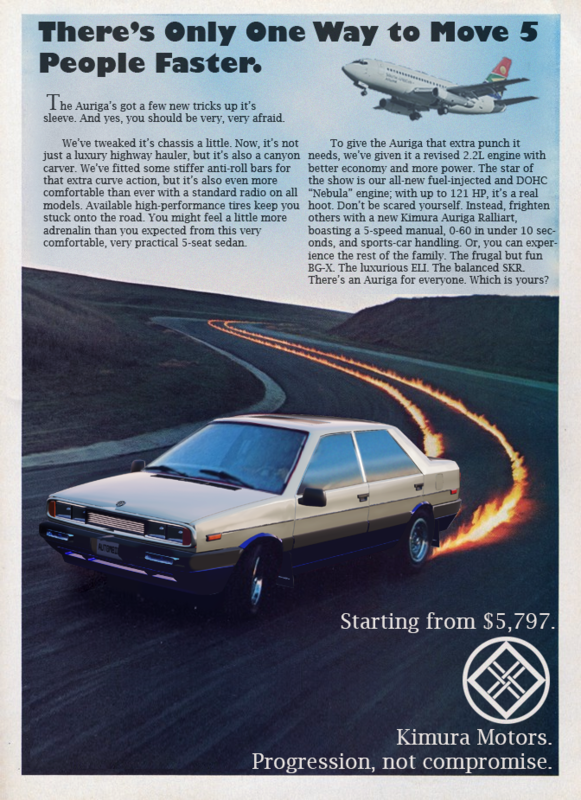 Clark had a chance encounter with Malcolm N. Bricklin and realising his success with bringing Subaru to the states. He took a flight to Japan to meet with a number of prospective firms. There he quickly realised most opportunities within Japan was gone but in talks with Komodo Motors, he learnt of an upstart company in the then still relatively unknown but rapidly liberalising Democratic Socialist Republic of Anikatia (DSRA). This company was known as Maesima Motor Corporation and due to the recent efforts of state liberalisation, it had begun a technical partnership with Komodo Motors of Japan. Clark saw a chance to be the first to bring an Anikatian vehicle to the states and quickly arranged a visa and flight to the island nation. After some difficulty, he got a meeting through the then parent company and state owner Anikatian Auto Union (AAU). 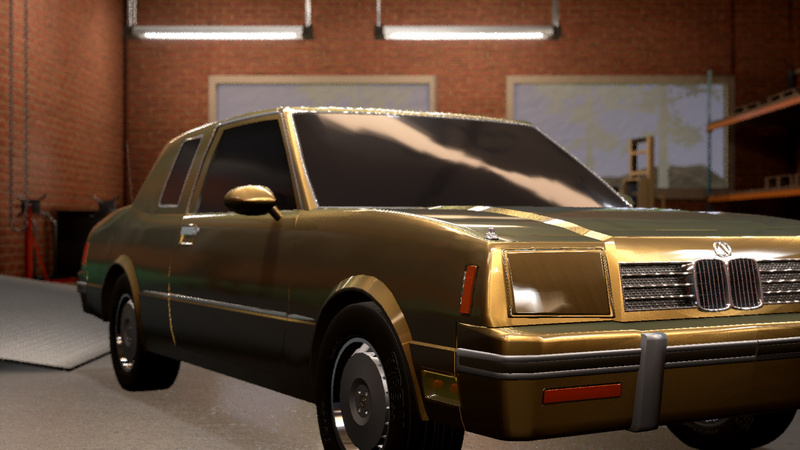 At the meeting, Clark saw AAU’s then under development Maesima NV-982 car, he was able to secure an exclusive contract with Anikatian Auto Union to import Maesima cars and trucks into the United States. He formed Maesima Motor America, and which was set to import a simple, low-cost car to the U.S. market. 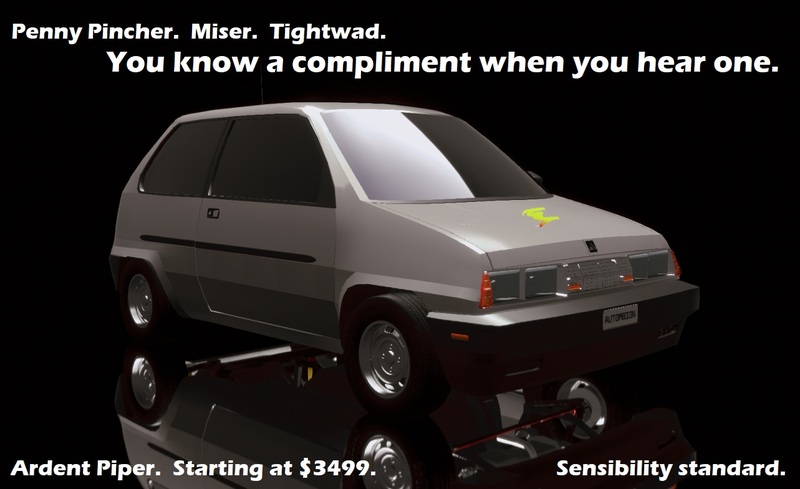 He agreed to import the Maesima NV-982, the Celento. Before this could happen Clark and his engineers suggested some 600 changes in the Celento for export, to keep the Celento competitive with other cars in its class, a 1.5 to 2.0-liter 4-cylinder engine, in the U.S. Those changes included improvements in the anti-pollution system, comfort adjustments, safety devices and special carburetors for lead-free gasoline. In addition to the main Namju Plant complex, about 200 smaller Eunchuol factories produce parts for MMA cars. Clark had his own people at the plant to monitor the effort, constantly stressing the need for high quality. A team of quality experts sent a cadre to Namju to study the factory and recommend improvements. The first shipment of the Celento’s sailed from the Anikatian eastern port of Namju for California in January 1982. Now in its final year! In 1982, Kimura continued to grow. They refreshed their most popular product in America, the Auriga, worldwide. 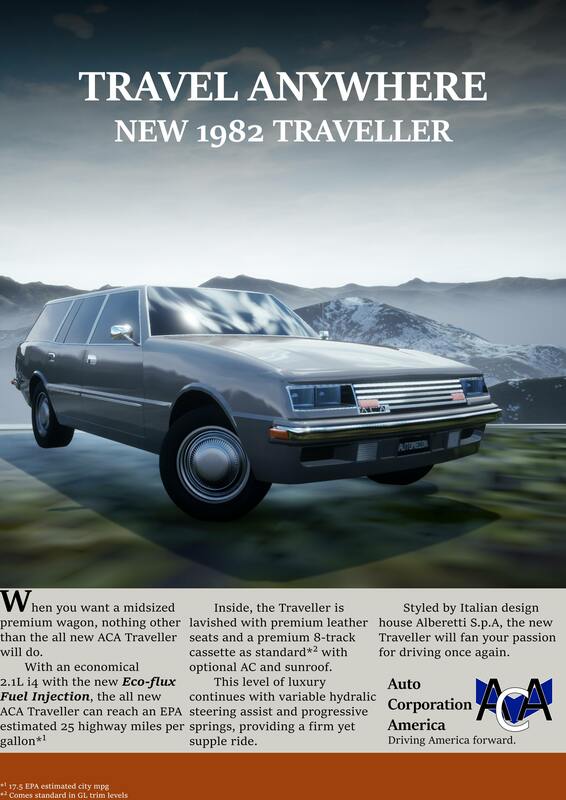 The Auriga was refreshed in 1982 after receiving some input from buyers, asking for a more comfortable experience. Auriga models were given more comfort-oriented suspension and more sound dampening and standard features. A new Ralliart trim would be added in 1982 as a “street-legal” version of Kimura’s Group B Auriga. 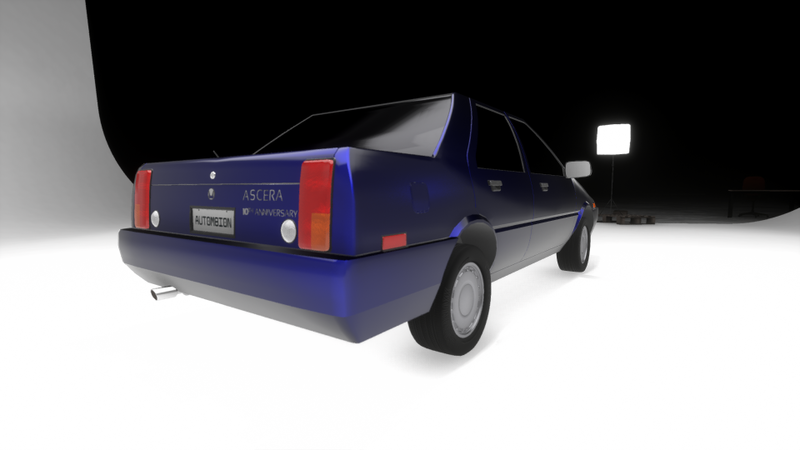 The Auriga featured Kimura’s first foray into using electronic fuel injection along with a DOHC engine. 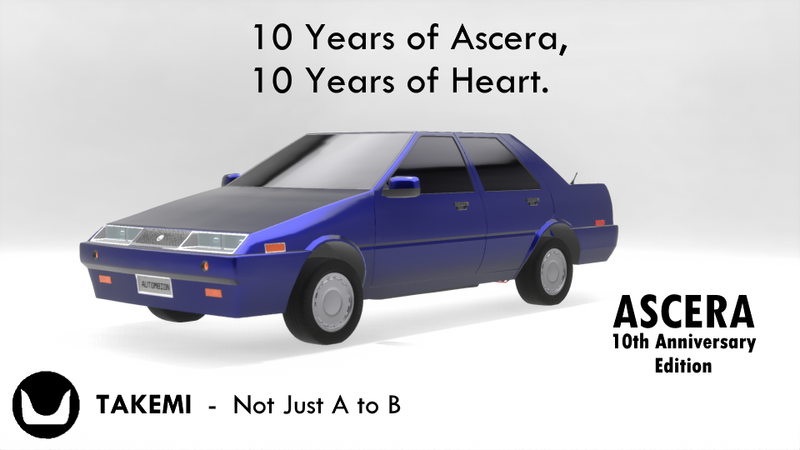 Kimura would produce a DOHC Inline-4 ngine was produced alongside an SOHC variant until 1994, where the two inline-4 powerplants were merged into a single DOHC design. 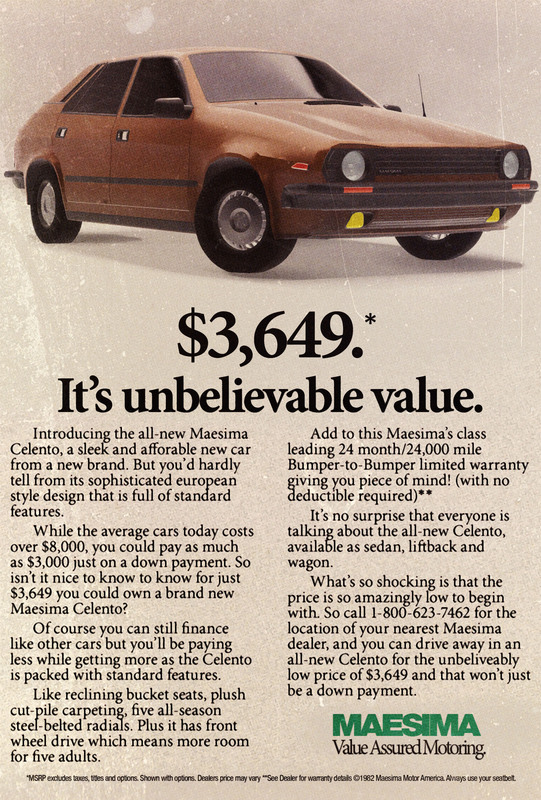 Here is an ad for the 1982 Kimura Auriga Ralliart.